For two breeding seasons, bald eagle parents have raised families high above the American River. 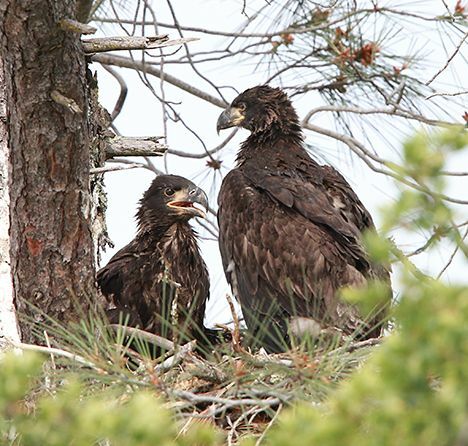 Fueled by a room-service diet of fish, reptiles and rodents, the eaglets quickly grew juvenile feathers in place of hatchling fuzz. 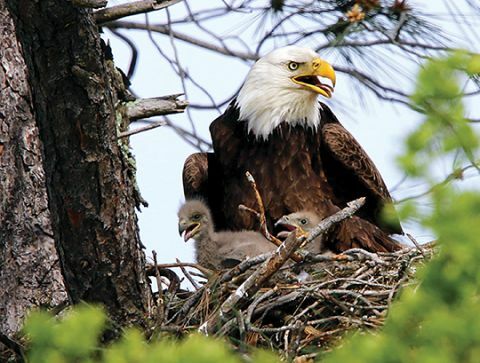 SACRAMENTO REGION, CA (MPG) - Noted last year as the closest recorded bald eagle nest to Sacramento, the same eyrie was this summer blessed with more eaglet babies. These made debut flights earlier this month. Orangevale kindergarten pupils named the 2017 hatchlings Poppy and Peekaboo. Now 15 months old, these juveniles are established in new American River territory. The children retained naming rights and this year honored explorer Admiral Richard Byrd by choosing “Byrd” for the Alpha chick. They decided on “Rainbow” for the youngest. The twins busted from baseball-size eggs a week before they were first photographed on March 23. Nourished by non-stop room service, they achieved their parents’ great size in 12 weeks. At 13 weeks, they spread seven-foot wings and flew. Genders are yet uncertain; popular lore has the precocious Alpha as male; the timid Rainbow as female. Like Byrd’s heroic namesake, the Alpha explored air, land and water during his dramatic maiden flight. Fledge days are stressful for parents and observers. Flapping boldly between trees on June 11, Byrd over-flew home base. His triumph rapidly turned to trial. The novice clipped a high fence to crash-land near a public trail. Without strength or experience for ground-level takeoff, his confusion was agonizing. For 30 minutes, he beat a clumsy to-and-fro on the clay path. Observers formed a mobile shield against dogs and joggers until Byrd at last gathered speed and crested the fence to safety. Even after this trauma, the first-born refused to return to the nest. He ignored his sister’s anguished cries; he defied mama’s voluble instructions. Explorer Byrd completed extraordinary traverses over the river at its widest. He drank from the waterside. While on the lam, the eaglet was brought enough fish to prevent starvation but not so much as to reward rebellion. After three days, his parents coaxed him back to the family buffet. Compared to Byrd’s surf-and-turf debut, his little sister managed a text book effort. Early on June 13, her papa delivered breakfast and evidently issued flying orders. Rainbow launched and, talons trailing untidily, flew 50-yards to an adjacent pine. Here she lurched before gaining confidence for the home flight. Papa soon encouraged an encore. This time, the debutant fell asleep on a foreign branch before heading home. Having raised at least three previous broods, Mama Bald is a nursery pro. Her mate is younger – this is only his second adult season – but he is now a prolific hunter and confident dad. The parents’ combination of protection and tough-love comes with sacrifice. Exhausted four months of 24/7 hunting, mama and papa are now completing their parenting season. The nest is collapsing under the strain of many clumsy landings and sibling food-fights. Repairs can wait. If this season follows the 2017 template – Byrd and Rainbow will be left in the care of sub-adult relatives while Mama and Papa wing off on distant vacation. By fall, they should return to rebuild and prep for a 2019 family. Hard lessons in self-sufficiency loom for the 2018 babies. A testament to the regeneration of a species threated with extinction only 50 years ago, this American River family is well now established in Sacramento County suburbia. The raptors’ on-going residence is a joy to human neighborhoods in their flight-path. Like the nation they represent, bald eagles are resilient. They’re also selfless providers, committed to family. They are single-minded in preparing children for independence. They control vermin populations; they neither waste nor pollute. By instinct, they are fantastic stewards of the natural world. Our national icon is well-chosen. From these fellow Americans, we might learn much. Follow Susan Maxwell Skinner American River Nature Blog on Facebook.